Life is all about failures and learning from them. But, why does failing seem so bad to so many people? And why does it often play such a heavy role in our lives and stop us from doing things that will make us happy, make others happy, create possibilities, live lives we love or even make a difference? 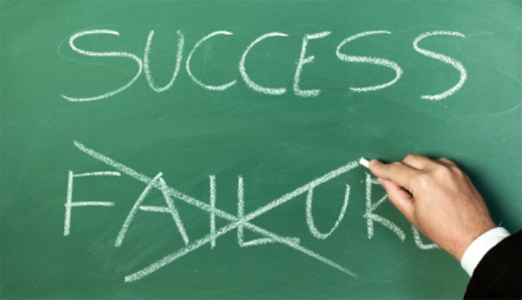 Failure has such a negative context in so many people’s lives. Even when we were at school, the thought of failure wasn’t a good one. The dreaded thought of your report card arriving in the mail, watching as your parents opened it, analysing it for what seemed like a decade and then showing you one of those looks…you know, those looks that could send shivers down your spine! Some kids aren’t too fazed but, I’m afraid, I was one that always thought I would fail and although, I never did, there was always that fear of failing or of being seen as a failure. It’s called HUMAN NATURE. And, quite frankly, who cares?! That being said, I want to challenge you to start facing your fear of a particular project or business concept. Get a writing pad and a pen with lots of ink. Set an alarm for 15 minutes’ time. So if it’s 1:15, set your alarm for 1:30. Then, I want you to write NON STOP until that alarm has stopped. Write about your fears, what is stopping you, what is stepping in your way, why you have those fears, what it will mean to you if you fail and anything else that you can think of that relates to your being afraid of taking the big leap you so often want to try. When the alarm stops, finish only the sentence that you are busy with. Then, STOP! Write NO MORE and NO LESS. Put the pieces of paper you have written on away in a drawer or cupboard – don’t read them. THEN…..do you hear the drum roll?? Invite a friend around. I ask that you invite someone who isn’t the most pessimistic in the bunch for your own sanity. Bring out your papers and set an alarm for 15 minutes again. Ask your friend to press “GO”. Then, my special Mamma, you read and read and read from the beginning of your document right through to the end. If you reach the end, you start from the beginning again until that alarm goes off. Then, look at your friend – how do they look now? My guess would be at this point in time most will look completely and utterly BORED and have a look that could be seen as dismay or confusion of expression of “why would you expose me to such rubbish?”. How do YOU feel after reading all that you write down? The fear of failure will possibly always be there or will always exist. But, success can feel SO MUCH better than anything and the only way you can have SUCCESS is to give it your best shot! I’m by no means saying withdraw your life savings and travel the world selling a product that no one has ever heard of. You DO need ALWAYS to be responsible (especially when you have a family to think about), but if you don’t start somewhere, you will NEVER KNOW! You have to believe in yourself and you must give it your best shot. Ask for help! No one is perfect and no one can do everything – that’s why you get businesses with employees. People need help and there’s nothing wrong with asking for help and getting some help. Do market research – call some of your Moms together or get a group of people who would be considered your target market and ask them to take part in a survey. You also get email surveys available now, which are great! Picture how you see your business running and put together a list of milestones or goals you would need to reach to get there. Then for each milestone / goal, put tasks together that you will need to do in order to move forward. Put timelines next to each TASK and GOAL. So, by 21 April, you want to have completed Task X and by 30 April, you want to have reached that milestone / goal (all tasks would be complete). Get someone involved who can and WILL hold you accountable through the process of trying. Get their feedback on your milestones / goals and your tasks. Perhaps you have missed a step or perhaps you are being unrealistic or underestimating your abilities. Getting a 3rd party’s input is always a good thing. Set alarms to keep reminding you on tasks and make sure to follow through. Always give feedback to your “supporter” and make sure they are checking in with you and “pushing” you forward. If things don’t work out, then they don’t work out. If you stuck to your goals, you did your tasks and you feel you failed, review what went wrong. Perhaps, it was a bad idea or perhaps certain processes need to be improved. TRY AGAIN or MOVE ON! I will tell you one thing – you will have learnt so much about yourself, your abilities and more about life that I would guess that many of you would never change it! The world is your OYSTER – time to start finding your pearls ladies – you can do it. And, if not on the 1st, 2nd, 3rd….100th time, just keep trying! Claire, this is such a cool article 🙂 And so true! I like it, especially seeing as over the past few weeks all I could think about was how I was failing in life on all fronts. Why? Because I was trying to be a superhero and take on more than I could possibly cope with (even with all the support in the world). So you know what? Last night I sat down with my partner and talked through my fear of failure. Discussed what I needed to give up and where I needed to shift my focus. Although a part of me is a bit disappointed about what I’ve had to let go, a bigger part of me is relieved beyond belief. I know that from now on I’m going to have more energy, more time and be more of a human than I was when trying to stretch so thin. This means I’ll be a better parent, partner, employee and most of all happier and less stressed me. Thanks for the reassurance from such a well timed article. LOVE your writing, love your ever inspiring spirit. THE one main player holding me back from my successes is the fear of failure!! as the saying goes… We are the action of our thoughts!! I SO have to give that Fear a huge kick out of my belief system! THANKS for sharing and your ongoing support! !